You'll be £19.99 closer to your next £10.00 credit when you purchase Armoured Horseman. What's this? New memoirs by combatants in the Second World War are sadly rare today due to the passage of time. 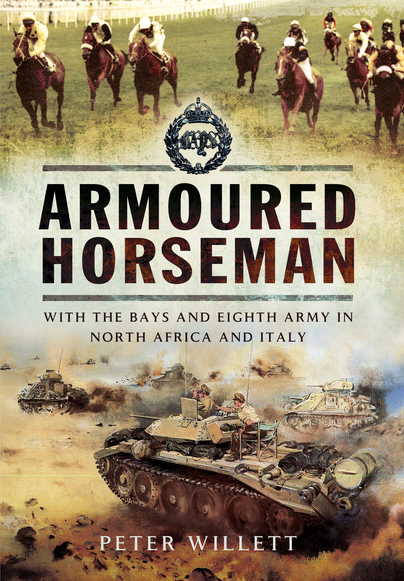 Armoured Horsemen will be warmly welcomed as the author, now into his 90s, fought through with The Bays from Alamein to Tunis and then on up Italy until VE Day. As a young tank troop commander his chances of survival were slim and tragically many of his friends were killed. Peter Willett, a professional journalist and much published author, is superbly qualified to describe his war and the experiences of his fellow cavalrymen. He tells a moving story with characteristic lightness of touch and modesty. As well as satisfying the military enthusiast, Armoured Horseman will find a ready audience in the racing fraternity. Peter describes equestrian activities in post-war Austria and goes on to summarise his career as a racing journalist, authority on breeding, membership of the Jockey Club and long association with Goodwood. Overall this is a rather entertaining description of life in a unit at the heart of some of the most significant events of the Desert War. A well-known figure in the world of horse racing, the author is writing here about his time with The Queen’s Bays in WW2, serving in the North African and Italian campaigns. He was in the thick of the action from the Msus Stakes, through El Alamein, where he commanded the leading troop of his regiment at the beginning of Operation Supercharge, to Tunis and later took part in the Gothic Line battles in Italy. Mr Willett provides a moving and graphic story with a mix of frankness and lightness of touch. This is however, not just a military account, as the author covers equestrian activities in post war Austria and goes on to summarise his own career as a racing journalist, breeding authority and membership of the Jockey Club. The whole forms an interesting combination of military and civilian life in which horses – both armoured and ‘unarmoured’ – play a central role. A number of monochrome illustrations and five maps support the text. Well worth a read. An author of military history has to research with care, locate suitable illustrations and then write down what happened with equal care, drawing conclusions and providing new perspectives and insights. However, the first, and often most difficult step, is to decide on a person, or campaign, or battle to make the focus of what can become a fresh insight. This new book covers familiar ground, because there have been many books that tell the story of the major North African and Italian campaigns, but it brings forward a unique story that is fascinating, compelling and charming. This is a must read WWII account but it will also appeal for its horse racing connections and the very human story that it tells. I have just this moment finished Armoured Horseman (which I read in 24 hours). What a truly wonderful book! I almost felt I was there and realised that between all the horrors of war there were also some better times and great friendships recounted so brilliantly. It should be made into a film! This is Peter Willett’s memoir of his service in the Second World War, all of which was with the Queen’s Bays, a tank equipped cavalry regiment in the Eighth Army serving in North Africa and Italy. It is an utter delight to read; the authors prose is engaging and the story compelling... There is rich detail of life in armour, both in combat and in the rear. Willett's recollections of combat are crisp and understated; the author saw plenty of it. The tight knit community of a cavalry regiment shines from the pages, particularly on an awful day in Italy when the regiment lost almost two entire squadrons (two thirds of its combat strength) in a few minutes, suffering 64 casualties in the process. This is very much a memoir of a young officer at war. As such it casts light on the pursuit of fun and what soldiers got up to when their units were not in action, which of course was the status of most of the British Army most of the time. Peter’s interest was racing and at the end of the war he quickly became involved in organizing racing in Italy and Austria... This is a wonderful book and I commend it to you wholeheartedly. There are many fascinating insights into all aspects of serving in an Armoured Division during the Second World War... This is a marvellous and well written book that is an easy but fascinating read giving an insight into the bitter fighting as seen through the eyes of a young cavalry officer. Highly recommended for all those interested in British Armour of World War II. Peter Willett joined the Army in August 1940 after Wellington College and Cambridge University. He was commissioned into the Queen’s Bays and this book describes his experiences. He was the last surviving of those who fought at Second Alamein. Post-war he enjoyed a distinguished career in horse racing as a journalist, author, bloodstock consultant and administrator. He was a member of the Jockey Club, then the governing body of British racing, President of the Thoroughbred Breeders Association and a director of Goodwood for 35 years. Among the recognition he received was the coveted Daily Telegraph Award for Merit at the Cartier Racing Awards. He passed away in November of 2015 at the age of 96.